Shirts With Random Triangles: Frank Beamer says Ohio State has "SEC Speed," compares J.T. Barrett to Braxton Miller. Frank Beamer says Ohio State has "SEC Speed," compares J.T. Barrett to Braxton Miller. Frank Beamer is dropping some heavy praise on Ohio State. Or maybe he's dumping on the Big Ten. Either way, the Virginia Tech head coach complimented the Hokies' Week Two road opponents for a trait more associated with SEC schools - the legendary "SEC Speed." "Ever since I've known about football, you always say Big Ten, they're not quite as fast as the SEC," Beamer said during a Monday news conference. "But this one (Ohio St.) you don't say that." "You look at these skill kids, the quarterback, the speed they have on defense, this is not one of those teams that you have associated with the Big Ten in the past." That Buckeye QB would be redshirt freshman J.T. 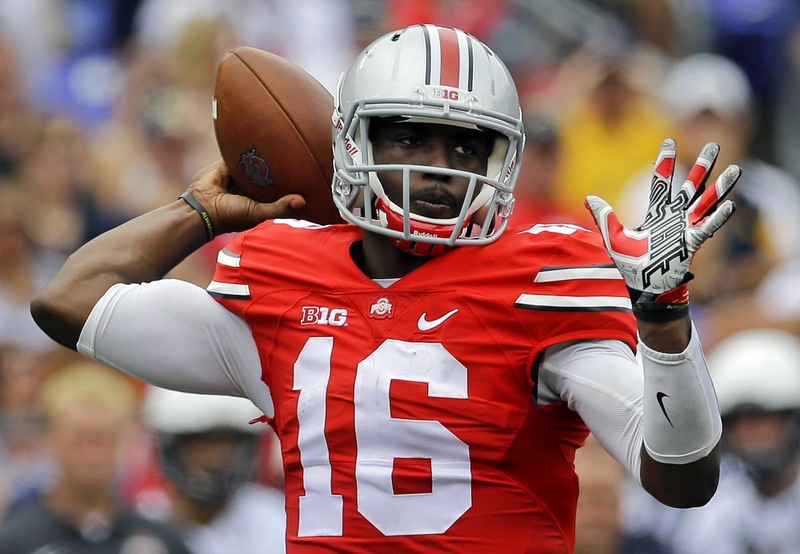 Barrett, who replaced Braxton Miller following an injury that ended the senior QB's season before it began. Beamer also complimented Barrett, whom he said "was kind of the same guy,"as Miller. "I don't think much (is different)," said Beamer. Maybe experience, but this Barrett kid is 6-1, 225 (pounds). He had a great game against Navy running and throwing the football, so to me you've kind of got the same guy without some experience, but otherwise it's about the same. Otherwise, I'd say it's exactly the same." The "SEC Speed" comparisons will surely be taken as a compliment to Urban Meyer. The Ohio St. head coach came to the Buckeyes two years after his departure from SEC member school Florida, where he led the Gators to two BCS titles, two SEC titles, and four SEC Eastern Division titles. Virginia Tech and Ohio St. are set to face off inside Ohio Stadium at 8:00 PM ET on Saturday. The game will be broadcast on ESPN.